Brooke Nico lives in Kirkwood, MO, where she cofounded the yarn shop Kirkwood Knittery. 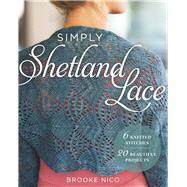 Brooke teaches at knitting events around the country, and her books include Lovely Knitted Lace and More Lovely Knitted Lace; her work has also appeared in severalknitting collections. FindBrooke’s designs online at kirkwoodknittery.com.